Living in Berlin, Germany brought to me many memorable moments. One of those moments took place because of a decision I made to stop and buy some fruit. After World War II, the Soviets were one of the major powers to occupy postwar Berlin along with the United States, Britain and France. Berlin was sectioned off and became a divided city. East Berlin reflected the drab oppression of Communism. West Berlin was like a colorful garden-island of freedom. After the Berlin Wall came down in 1989 it was like the surrounding pond of oppression was drained away leaving the beautiful island of West Berlin standing for the world to see. Even into the late 1990’s, when Jan and I lived in Berlin, this contrast still lingered in some neighborhoods. In 1998, the 50th anniversary of the Berlin Airlift was celebrated in Berlin. The Berlin Airlift was an aerial supply line used to bring food and supplies to the residents of isolated West Berlin after the Soviets cut off supply lines in an attempt to gain a deeper hold on the city. At the time the airlift began, in the summer of 1948, the people of West Berlin only had 36 days of food on hand and a small supply of coal. Feeding the two million residents of the city would require that 1,534 tons of food and 3,475 tons of coal be flown into the city each day. To accommodate this massive airlift flights would take off every four minutes, around the clock, seven days a week to bring food into the city. It was a massive and merciful undertaking. That day in 1998, when I stopped to buy fruit, was like any other in my daily routine in Berlin. I had business downtown and used the S-Bahn to commute into the heart of the city. On my return, my last S-Bahn stop was in our neighborhood of Lictherfelde. Under the train platform was a small kiosk where a vendor sold fruit. As I stood in front of the fruit stand a man approached who looked to be in his 70’s. When he asked to buy some fruit from the vendor I could tell from how he spoke that he was an American, so I introduced myself. After we exchanged introductions, he told me that he was in Berlin to attend the 50th anniversary of the Berlin Airlift. He was one of the pilots who flew those daring and dangerous missions. He had been invited to come and be honored for his service to the nation. Many pilots who flew the Berlin Airlift lost their lives flying missions that took place in the most challenging weather conditions. Today, in Berlin a monument stands honoring the 39 British and 31 American pilots who lost their lives flying those dangerous airlift flights. These were brave men. One of the things the pilot shared with me was something called, “Operation Little Vittles”. Operation Little Vittles was created by the pilots as a way to shower the children of Berlin with candy and gum. The pilots put together miniature parachutes with candy and gum attached and tossed them out of their aircraft as they flew over the city. Hundreds of children would run to the landing zones of these little parachutes and taste candy and gum that had become a very rare treat in post-war Germany. 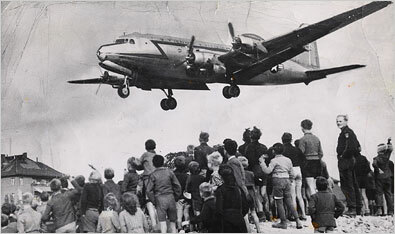 The Berlin Airlift was such an operational success and political humiliation that it forced the Soviets and East German Communists to eventually lift the blockade on the city. Shortly after midnight on May 12, 1949 the blockade of Berlin ended. The mission of these brave pilots speaks to me of what I see as part of the mission of the Church. Many lives in our communities are walled off behind works of darkness and God has given His Church a calling to bring life to those who struggle behind those barriers. The Church is their only hope. As I pondered what these pilots accomplished, I was amazed that amidst the technical flying skills required of them, they added a creative component to their mission by dropping candy on the hungry children of Berlin. So much of what I have found myself involved with over the last 30 years of serving the Church has been the tedious part of my calling – the business of ministry. God wants us to be faithful to do all the things we need to do to get the job done. This is part of being faithful to our calling. I have also learned that we are never to get so involved in the rescue of souls, and the business of ministry, that we can’t find a way to drop candy on those we are called to rescue. I think it is important to God that joy is part of the rescue plan.